Canada’s Corruption of Foreign Public Officials Act (CFPOA) will be strengthened, foreign affairs Minister John Baird announced on February 5, 2013. 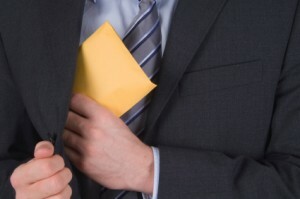 This law makes it a crime in Canada to bribe officials of other countries. Nationality jurisdiction: a long-standing weakness of the current CFPOA is that Canada only has jurisdiction to prosecute if at least part of the conduct giving rise to the offence occured in Canada. The amendments will allow Canadian authorities to prosecute foreign bribery by Canadian citizens (and permanent residents) and Canadian companies, even if no part of the bribe occurred in Canada. This means that Canadians working abroad, even for non-Canadian companies, will now be subject to the CFPOA. This effectively extends the reach of the CFPOA to many companies that are not themselves located in Canada. Books and records offence: it will be an offence to falsify books and records to hide bribes. Increased penalties: the maximum sentence will be raised to 14 years. This is significant, since offences for which a maximum sentence of 14 years is prescribed are not eligible for discharges or conditional sentences. This means that individuals convicted of foreign corruption will actually serve time in jail. Broader definition of business: the CFPOA only applies to bribes made in the course of business. Currently, the definition of “business” includes a requirement that it be “for profit”. The amendments will broaden the definition by removing this requirement. Thus business activities of non for profit entities will become subject to the CFPOA. Elimination of facilitation payments – eventually: the amendments will repeal the CFPOA’s exception for facilitation payments, when they are proclaimed in force at a later date. A facilitation payment is a payment made “to expedite or secure the performance by a foreign public official of any act of a routine nature that is part of the foreign public official’s duties or functions”. Currently such payments are tolerated as an unfortunate fact of life. Although Canada ratified the OECD Anti-Bribery Convention in 1998 and passed the CFPOA in 1999, enforcement action has lagged until quite recently. There had been no prosecutions at all when the OECD criticized Canada in early 2011 for failing to enforce its anti-corruption law. Since then, there have been three convictions. Most recently, on January 22, 2013, Griffiths Energy International Inc. pleaded guilty to paying $2 million in bribes to Chadian government officials to secure exclusive oil and gas rights in Chad. Griffiths self-reported after new management discovered the bribes. Griffiths was fined $10.3 million. Griffiths also incurred $5 million in costs relating to its internal investigation. The Griffiths case provides a good illustration of why nationality jurisdiction is necessary. The Griffiths Agreed Statement of Facts states that the parties agreed that the court has jurisdiction because of the real and substantial link between Canada and the offence. But it is not clear whether any of the conduct giving rise to the offence occurred in Canada. Had Griffiths not agreed to plead guilty, it is possible that the government may have had difficulty proving that an offence had been committed in Canada. Nationality jurisdiction removes the need to prove that some aspect of the offence was committed in Canada.